29-May-2010 – This confluence point is about 10 km to the west of Gori. The motorway from Tbilisi to the west coast passes Gori and the visit seemed to be an easy one until only 1.8 km remained. Then it appeared that we were on the wrong side of a river, but with a good view of the area where the confluence point was. Back at Gori we passed Stalin Square with a big statue of the town's son, headed across the river and then westwards again to the village of Skra. 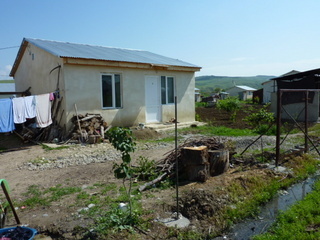 The confluence point turned out to be at the western outskirts of the village about 3 m inside one of the 81 small houses which had been erected for 300 refugees from South Osetiya in November 2008. The occupants of the actual house, a woman and her two children, were not at home, but her sister Ketino with her charming daughter Helena who lived next door were. I gave her the printout of the last two visits with Google maps, explained the concept of confluence points and took the required photos. PS. Time of the GPS is CET. Submitted Visit date Name Success? Status?